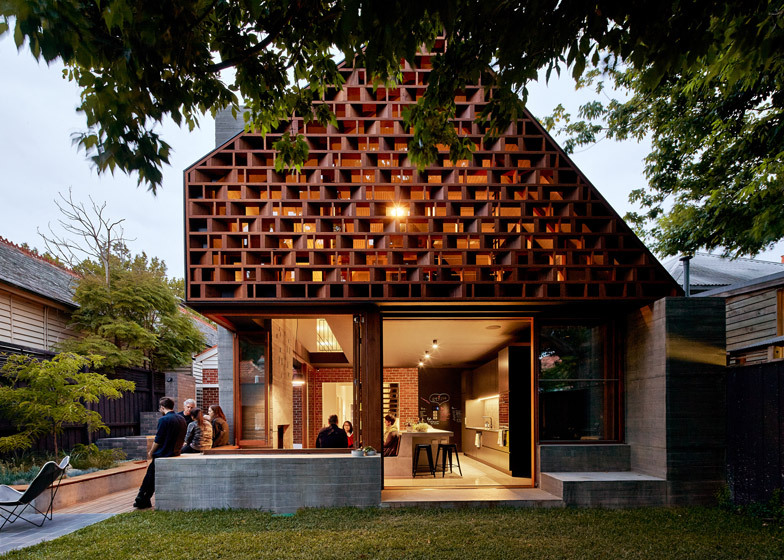 Melbourne studio Make Architecture has renovated a red brick bungalow outside the city, adding an extension featuring a decorative timber facade that references brickwork patterns (+ slideshow). 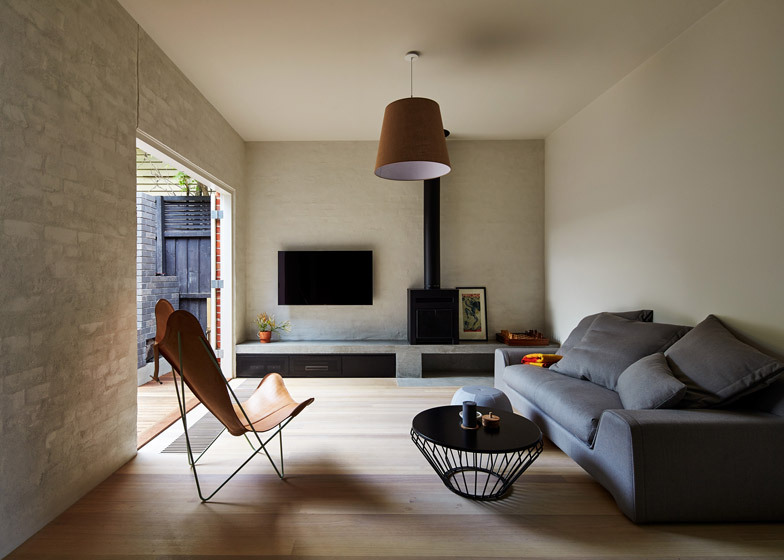 Make Architecture modified the existing dwelling in the St Kilda suburb of Melbourne by tacking a two-storey extension to the rear. It provides a living room and kitchen on the ground floor, and a master bedroom with an en-suite bathroom above. The lower storey was built using a combination of board-marked concrete, grey brick and glass, while the gable of the upper floor is partially enclosed by a gridded wooden screen. 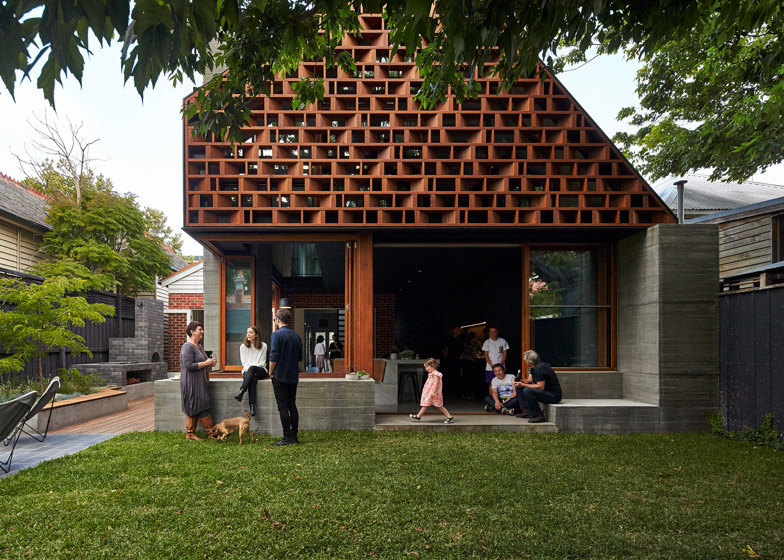 "Avoiding the 'white box on back' renovation, this project attempts to create intimate and connected family spaces," said the architects. 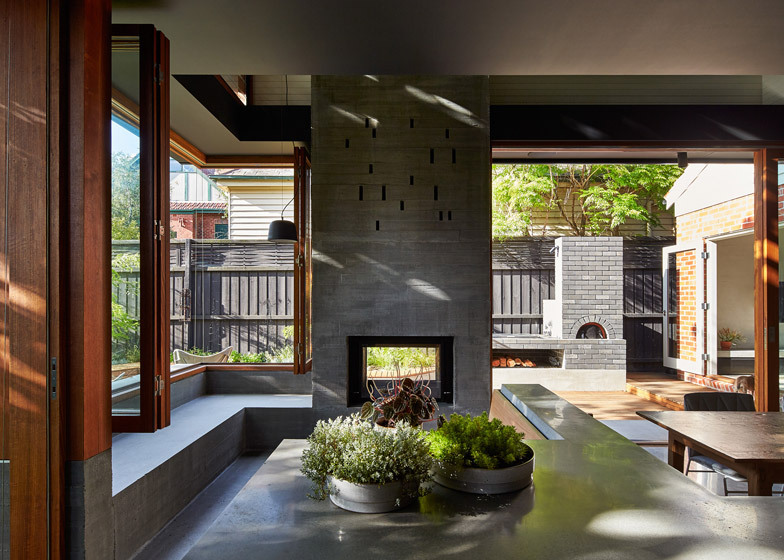 "Spaces are playful, conceived more like a favourite local cafe than a private house, reflecting this family's desire to create a home that allows them to connect with friends, family and their local community." 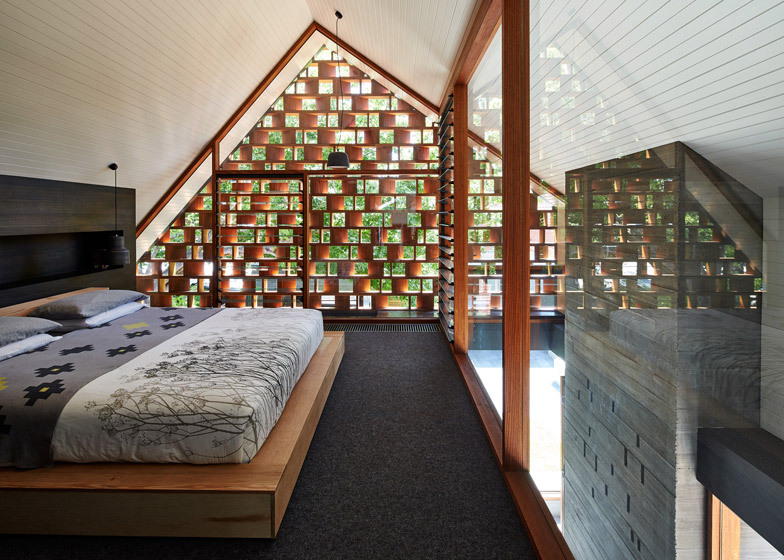 The wooden framework covers the glazed walls of the master suite, providing shade from the sun and from the gaze of neighbours while offering views over the neighbourhood and garden. 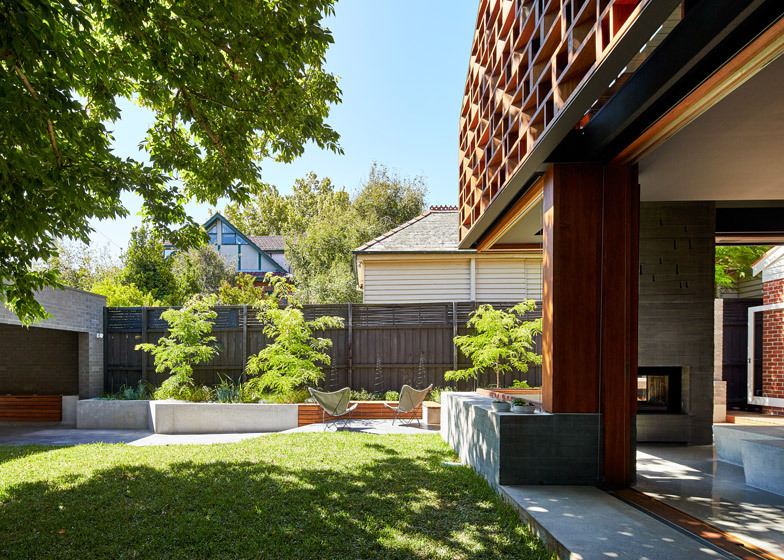 Downstairs, large glass doors open from the concrete-lined kitchen and dining space onto the back yard, intended to act more like a garden pavilion than the interior of a house. 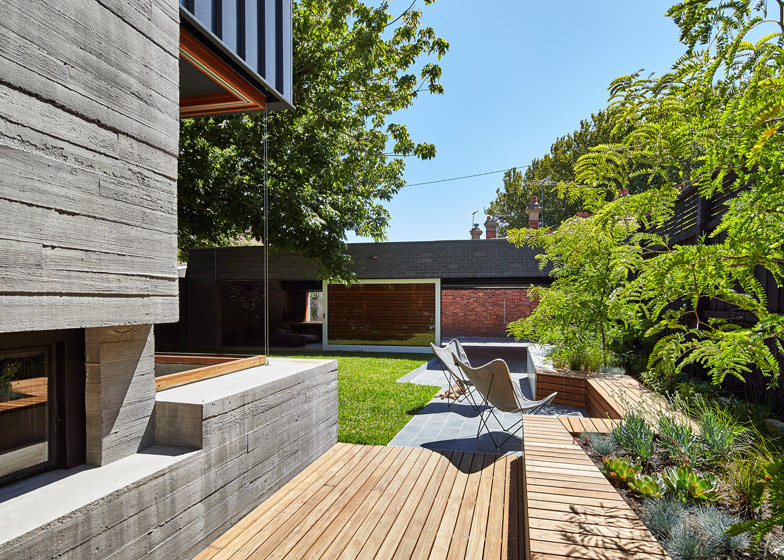 Concrete benches run around the outer corner of the extension to encourage residents to spend time outdoors. 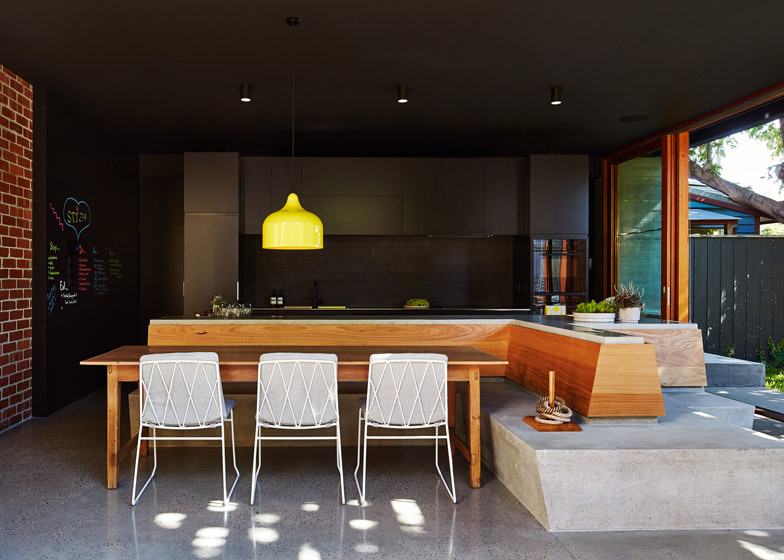 Concrete was also used internally to create integrated seats, benches and counters, contrasting with a red brick wall belonging to the existing house. Blackboard paint covers an adjacent wall to create a family noticeboard. "Design elements encourage social interaction and engagement; the indoor-outdoor fire place, pizza oven and landscape seat edges," said the team. "Steps and small seats have been incorporated into the design wherever possible to provide informal spots to sit and reflect." A staircase leading to the master suite rises through the centre of the living room, dividing the space in two. 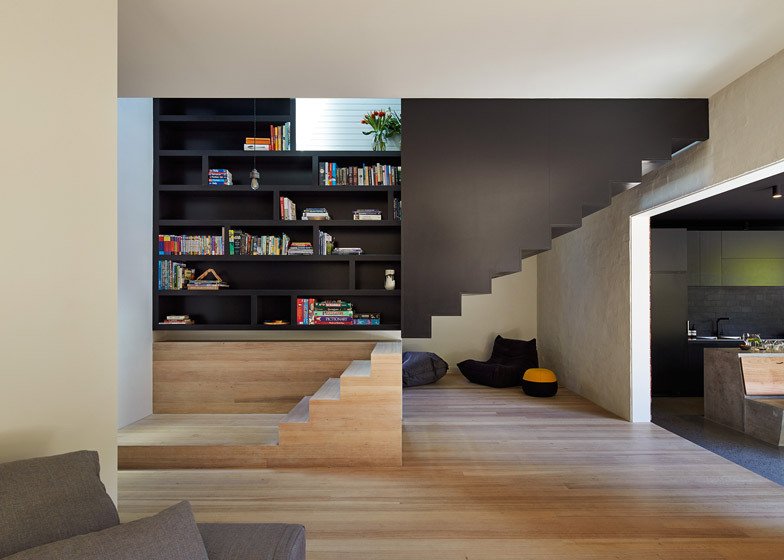 The staircase is also split in two, with a stack of pale wooden steps connected to a flight enclosed in dark wood. 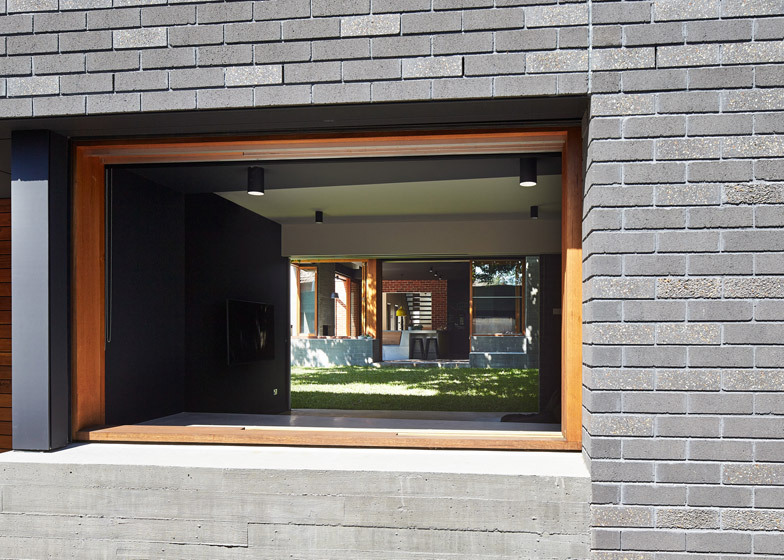 A garage and studio made from grey brick was added to the bottom of the garden, opening up an entrance onto a back alley that runs between neighbouring properties. 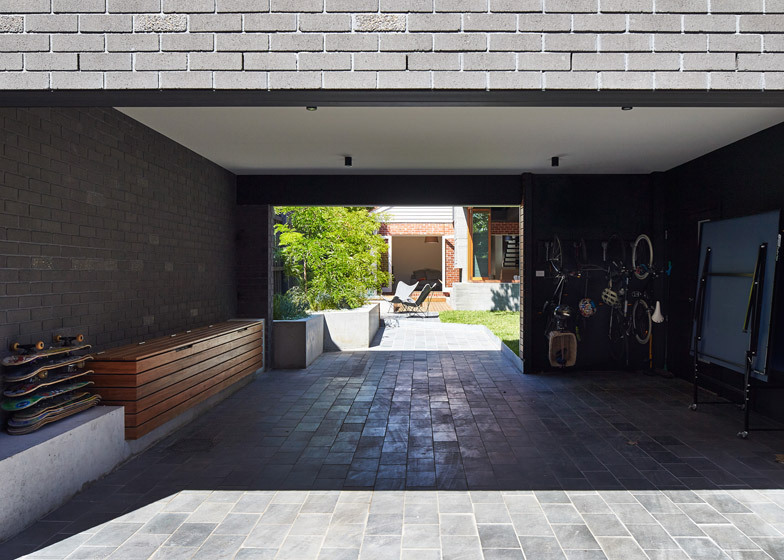 A strip of dark grey paving leads out from the back of the house to the alley, creating a clear sightline between the property and the road. 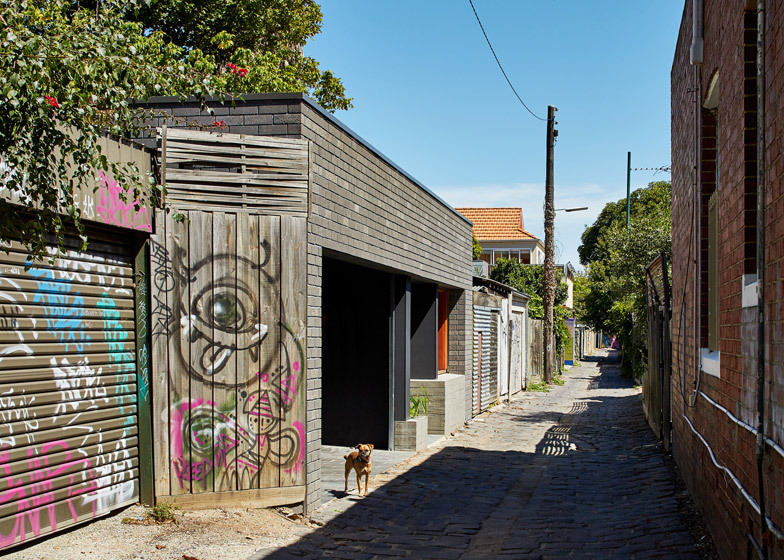 "The rear of the house and studio actively engage with the lane as a valued street address rather than turn its back on the rear laneway it faces," said the team. "We hope this positive ethos contributes to a socially sustainable community, knowing that ultimately this will help this house and suburb be a happy place to live," the team said. The project was given the name Local House, after the connection it aims to foster with the surrounding community.